Business Meetings in Hawkes Bay? 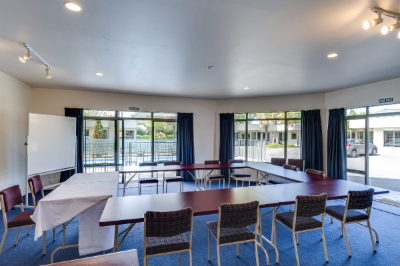 Portmans Motor Lodge Motel has a modern air-conditioned conference/meeting room for presentations, corporate training sessions, board and trust meetings, group workshops and a range of road shows, for visiting and local Businesses. It is also available to large groups of guests to use to congregate, whilst visiting Hastings. The conference room, central not only to Hastings but also the Motel Complex, has spacious car parking, is quiet and off the road and enjoys lots of natural light, making it suitable for exhibiting commercial trade displays & product demonstrations. large or small business meeting space to suit most needs.